The apartment is located in the heart of Puerto del Camen right between the old and new town, whilst easy to walk to the main beach. The area is very restful and quite. 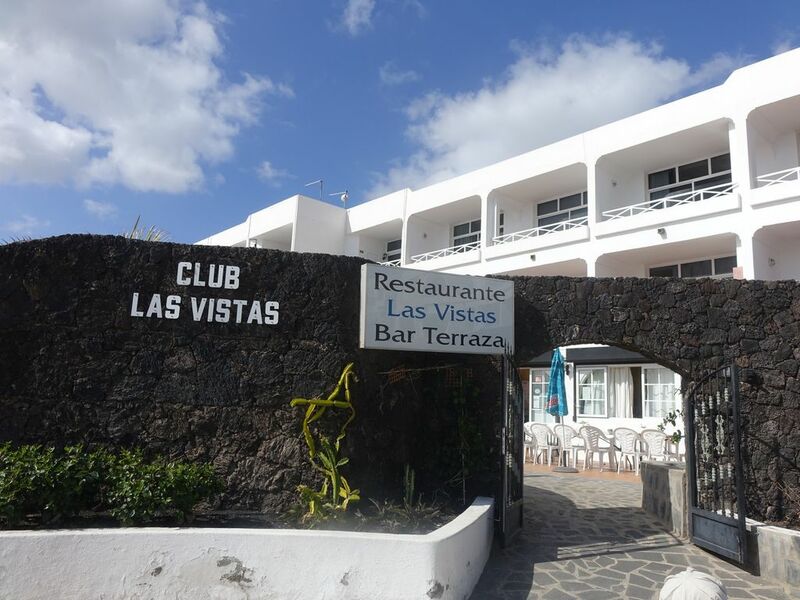 The ground floor apartment is situated in a small & well know complex "Las Vistas" with a reception, free public parking, newly renovated swimming pool & kids pool (in 2/2018), barbecue area, on-site restaurant and bar. It is a stone´s throw away from Biosfera Plaza shopping center, Spar supermarket and many restaurants & bars. The apartment has 45m2 and consists of a lovely bedroom with two single beds (pushed together to make a double bed) and spacious wardrobe, living room with two sofas (one new foldable sofa as of 7/2018 to make a twin bed), flat screen TV with cable channels (70) dining table, bathroom with a walk-in shower fully reconstructed (12/2018), a new washing machine (as of 2017), iron, ironing board and fully equipped kitchen with fridge - ideal for self-catering holiday. Moreover the apartment has a free private Wifi with unlimited data access (even though there is a free Wifi at the complex area/reception). We do not live on the island. We interact with our guests by email or telephone. For renting related issues we work with an English renting company that is always very quick in helping out in case of a problem. Moreover there is a reception that is helpful. No stairs at the entrance of the complex and no stairs in the apartment. Key collection - the keys will be in a lockbox. Details will be provided after you book. An array of activities are offered in the area, such as windsurfing, diving, golfing, bike rental and fishing. Lanzarote Airport is 6 km away. We are a couple from Czech Republic, living in Prague, having a little daughter. We love traveling, knowing various cultures and meeting new people. We fell in love with this place due to its unique location - it is close not only to the beach but also to our beloved harbor. Very centrally located and very peaceful, quiet and restful. If a length of the stay is longer than 11 days, the bed linen and towels are exchanged in the middle of the stay. private wifi internet with unlimited data ! There is a small portable oven put on the cupboard i.e. NOT a built in oven. incl. kitchen roll, dish cloth and scourer and bags for bins. In a dining area of the the living room there are 2 seats, whilst another two seats are at the terrace. Upon the request we can arrange personal pick up service from the airport and assistance to enter the apartment (20 Eur fee). Otherwise details to enter the apartment and code to the keybox will be provided before arrival. We really enjoyed our stay in your apartment. We feel that it is nicely equipped, quite comfortable and in a good location. There are a couple of comments that we hope will be useful for you to attend to. These are not criticisms but merely advising you of items for correction. 1. One of the beds has had a broken support leg and it has attempted to be repaired, but with a leg of a shorter length than all the others. This has resulted in the bed being tilted and somewhat uncomfortable to sleep upon. 2. The electric light fitting in the lounge should have 10 branches. Only 4 have a lamp bulb fitted resulting in the evening being more dim than necessary. 3. The Safe in the bedroom was not useable. this was due to, probably, a previous occupant having closed the safe and not disclosed the security code. I do not know if this can be re-programmed. Please accept these comments as advisory as you may not be getting the maintenance support for which you are paying for. Finally I would say that it will be our intention to return to Puerto del Carmen and when we do so we should like to hire your apartment again. We shall contact you in this respect when we have dates of choice. many thanks for your feedback. It is an excellent way to improve the existing conditions and the provided service. As for points 1 and 2 we will have a look and try to solve it soon. We also plan to buy a reading lamp. As for the safe code, the safe works and we have the security code, however I somehow forgot to pass it to you. To avoid any problems in the future I will put the security code to the check in manual. We will be happy if you decide to come back again one day.